Carl Grimes ~ "They were liars and murderers. We've protected ourselves. They wanted us dead. You're lucky your church has lasted this long. You can't stay in one place anymore, not for too long. And then once you're out there, you're gonna find trouble you can't hide from; you need to know how to fight". 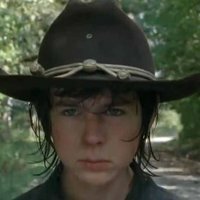 Carl Grimes was a normal 12-year-old who lived with his parents in King County, Georgia where he attended school during the day. One morning, Carl witnesses his parents fighting and having an argument about whether Rick cared about the family or not. Later that day after he finishes school, Lori comes to Carl and informs him that his father, Rick, was shot and is in a coma. Carl wanted to donate blood for his father as they are of the same blood type, which his mother had to talk him out of. During the first season Carl is portrayed as a shy and reserved boy, commonly only striking up conversation with his parents and members of the group he feels comfortable with, such as Shane Walsh and Dale Horvath. Carl, being relatively young, is shown to often be frightened by the horrors of the world and thus looks to his parents for shelter and comfort. Carl is a kind boy who does try to comfort those closest to him when he sees them in need, such as his mother when Rick went back for Merle. Carl had also shown to have some belief in God to an extent, such as when his mother asked him to say his prayers at the CDC. During the second season Carl retains his shyness but he does develop a bolder personality and is seen to be less frightened of the world, no doubt due to the horrors he's seen. He attempts to take on a more active role, wanting to help out in the group rather than be seen as a liability. This is shown when he finds the arsenal of knives for the group and when he helps with the search for Sophia. Like kids would be at his age, he is sometimes disobedient, but shows shame and guilt when his actions negatively impact the group. After being shot, Carl becomes stricken with negative thoughts. He begins wanting to fend for himself and to prove his independence and maturity - this is shown when he accompanies the adults in gun training. After his best friend Sophia is found dead in the barn, he begins to develop a noticeably colder personality. This is shown when he says he would have put down Sophia himself or when he followed his father into the barn to watch him kill Randall. Carl also is occasionally pessimistic and rude, such as when he insults Carol for speaking of heaven. Despite this he isn't above apologizing and realizing what he says or does is wrong. After Carl indirectly causes the death of Dale Horvath, he is stricken with immense guilt, thinking himself as a failure and vowing never to touch a gun again. It's not until his father talks to him privately in the barn that his confidence is restored and that Dale's death becomes a lesson. He realizes that he will have to mature to survive in the new world. This lesson was driven home by his putting down of Shane. By the third season, Carl has become battle hardened from months on the road. His firearm skills have greatly improved, as well as his tactical abilities. He is rarely shy around most of the group, which is assumed to be a result of spending months with them on the road. 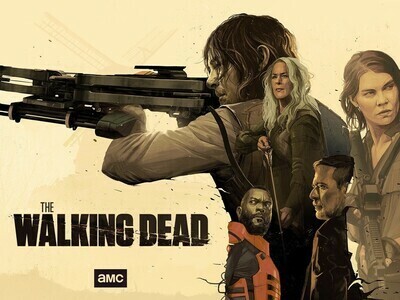 Despite Carl's maturity, he doesn't appear completely numb to emotion, and he does retain some of his child-like qualities, including cracking a joke now and again and his child-like crush on Beth Greene. However, after witnessing his mother's death, delivering his baby sister, and taking it upon himself to put down his mother, he becomes much more serious and cold. Carl goes through a stage of depression, not speaking much unless he feels that he has to such as when he told his father to take a break and stop being the leader for a while. Despite the traumatic effect his mother's death had on Carl, it also hardened him immensely. He becomes very brave, constantly helping people and even risking his own life to save others such as when he saves Michonne outside the gates, or his father from Morgan, despite his father's pleading to stay back. Throughout the course of the season, Carl begins to unwind, no doubt caused from the brutality of the world with the Governor at the center. Carl kills a boy who was projecting dubious behavior after being asked to surrender, evidencing how cold and emotionless he has turned. Rick, frightened of what he's allowed his son to become by being a relatively inactive parent, spends more time with Carl. He encourages him to pursue endeavors such as farming. By the fourth season Carl has become much more relaxed and accepts the fact that there is more to life than survival. Rick has taken his father role more seriously. It is shown he has become more harsh towards Carl, but we are assured this is for his well-being. Carl understands what his father is trying to do for him and actually tries to honor his father's wishes by trying to be a kid again. Of course, he finds this difficult, no doubt because of the horrors he's seen and the things he has done. Despite his more accepting and relaxed personality, he still retains his more serious and realistic view-point on the world, such as when he chastised Lizzie for naming the walkers and believing they're not that different from living people. Carl's maturity and ultimately his worthiness earned him back his gun, which he accepted honorably, Rick obviously confident in Carl's ability to use the weapon. Despite Carl being young, he is not afraid to call out his seniors when he thinks they are doing something wrong or illogical. This is shown when he tells Hershel that he's not going to let him go into the woods alone or when he tells Rick that he should let Carol teach the other kids how to defend themselves. 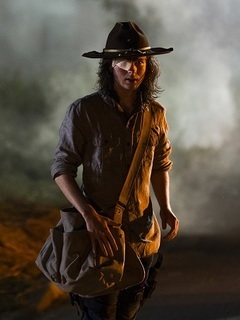 Throughout the course of the first half, Carl gradually becomes more integrated into the defense of the prison, even fighting beside his father to stop a horde of walkers. By the prison's fall, Carl appears to be shaken up, no doubt due to the loss of the prison, Hershel, and presumed loss of his sister. By the second half of the fourth season Carl is shown to be a very unstable individual. Mentally and emotionally scarred from the battle and subsequent loss of the prison, he is frequently seen to have outbursts of intense emotion. Driven by a need to pin his anger on something, he directs his rage towards his injured father. By Michonnes return, they have accepted the fact that Carl is becoming an adult. In the fifth season, Carl has become a much more emotionally stable individual. Taking on an adult role in the group, Carl helps in the fortification and defense of the church, as well as protecting baby Judith. He seems to have cooled down a bit in terms of mental stability, able to laugh and smile, but still very much capable of cold blooded murder. This makes him a very dangerous person as he is able to do what is necessary to survive but is still in control of his mental and emotional state.